Oh no, hang on, that's real life. The game doesn't have a story. It's a selection of exercises and minigames to improve your balance, muscle tone and basic fitness. It does feature a particularly patronising set of bathroom scales, though. 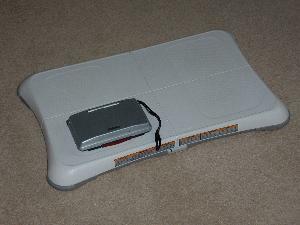 Gameplay: Wii Fit comes complete with a wireless balance board. The thing is about the size of two normal sets of bathroom scales put side by side and allows the game to measure your weight and monitor your balance. By detecting how your weight moves around the board, the game can tell which way you're leaning and how you're standing. Each day you play, the game records your weight and gives you a fitness test. The test consists of a couple of short exercises which usually involve shifting your balance about at the game's command. Your 'Wii Fit Age' is calculated and compared with your actual age. Then an animated balance board shakes its head and laments how overweight and decrepit you are. Fortunately, things pick up after this and you get to choose from a selection of yoga exercises, muscle workouts, aerobic exercises and balance games. Spend enough time playing and you unlock more. Yoga exercises: Hold a pose while maintaining your balance. Muscle workouts: Perform a set number of exercises (such as press-ups) in rhythm with the game. Aerobic exercises: Jog on the spot or hula for your life. Balance games: Head footballs, ski a slalom, guide balls through a maze or suchlike. Save System: Frequent auto-saving of achievements and high scores. Comments: This is an odd one. It's not really a game. It's an attempt to make exercise fun. There are a few niggling issues like body weight being measured in stones and pounds in the UK rather than kilograms unless you tell your Wii you've suddenly become German. Also, certain activities (notably the ski jump) are very short but it takes ages to start another shot. More seriously, the game always seems to praise weight loss and chastise weight gain. It constantly has a go at Sprog1 for having put on a pound and makes him choose a likely cause for his failure. This is despite the game regularly informing him that a pound is within daily fluctuation levels. More than that, it knows both that he's eight and that he's a bit on the skinny side. We have to keep telling him the game is wrong. This is a major (and scary) flaw. It's worse when it lays into my light-as-a-feather three-year-old daughter. Be aware. Even when it's not being plain evil, the sanctimonious animated balance board which gives you hints and tips is pretty irritating. It's as if that annoying paperclip from Microsoft Word knew your weight and wanted to make a big deal about it. Not good. Despite these issues, Wii Fit is fun exercise. 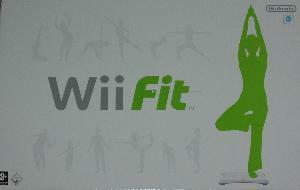 Just as a nicotine patch alone can't stop you smoking, however, Wii Fit won't make you thin on its own. You have to make it part of your life. Cunningly, the game encourages this by rewarding effort over achievement. Putting in time, rather than gaining high scores, unlocks new activities. Conclusion: Wii Fit is to your body, what Brain Training is to your mind. It's not necessarily as scientific as it pretends but it's quite fun and it's got to be better for you than sitting slumped on the sofa watching trash. She does this whenever we're in a shop and she sees Wii Fit for sale... Then she falls over. Graphics: Pretty basic in places but they get the job done. The activities where your movements are mimicked on screen by your Mii (such as step aerobics and the balance game) are shown in a similar style to Wii Sports. The jogging course round a picturesque island is actually very pleasant. Length: There are over 40 activities but some of them aren't much more than sitting very, very still. You could see everything in a few hours but that's not really the point. The idea is to get into a routine of a few minutes every day... forever.